LightFreq has just launched on Kickstarter with hopes of raising enough moolah to bring the genius audio-blasting bulb to life. The smarty-pants lightbulb ships with an impressive raft of features, merging standard light fixture offerings with a HD music player, dimmer swatches, and dedicated smartphone app pairing. "An electrifying marriage of vision and sound, LightFreq is set to revolutionise the way we light our living spaces," says LightFreq Inc.
From your smartphone, you can control light levels, sound volume, and even the bulb's hue with 16-million colour options available. We're envisioning a cool sea blue paired with a ukulele compilation CD for optimum post-office chilling. If a beat-pumping light fixture isn't enough for you, then you'll be pleased to hear that the LightFreq also notifies you of incoming calls, texts, and alerts, and can even operate as an intercom between any of the LightFreq bulbs dotted about your house. If you're eager to snag a bunch of these brainy bulbs, there are some bonus options available. Multi-room lighting allows energy saving by turning the bulbs off and on depending on which room you're in. There's also a 'party' mode which lets you sync up a series of lights that will flash to a chosen song in perfect harmony. Perfect for homespun raves. The LightFreq gobbles up an economical 17 watts of power with illumination reaching up to 800 lumens. The bulbs operate a 360-degree beam angle, and will last for around 40,000 hours before they're officially dud. Audio clarity comes courtesy of a built-in 5W speaker that's been optimised for stellar bass and a non-tinny sound. 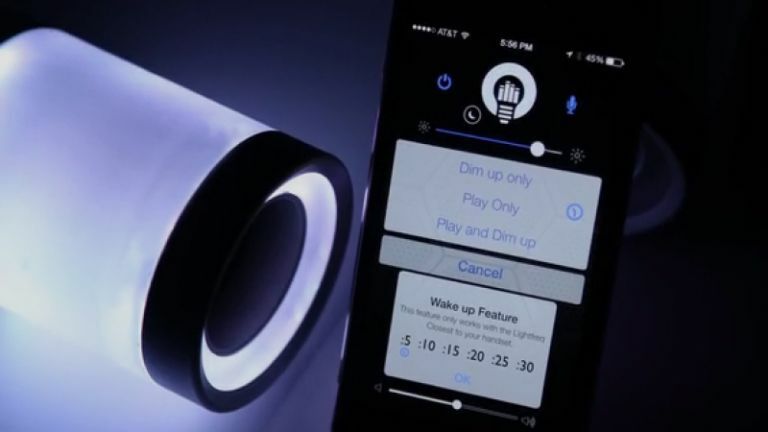 LightFreq Inc., says their bulb trumps the sound you'll squeeze out of a Beats Pill. The team behind the bulb are looking for $50,000 over the next 29 days, with each bulb costing $55 - roughly £33 sterling.